How many times have you turned a light on and forgotten to turn it off after you've left the room/area? Unnecessary consumption of electricity is fading away in backyards around the world. With the invention of Solar Fairy Lighting, people are jazzing up their gardens, doorways and balcony railings without causing harm to the world. These awesome lights require no wiring as they get their power from the sun and on a really sunny day they can discharge light for up to eight hours! 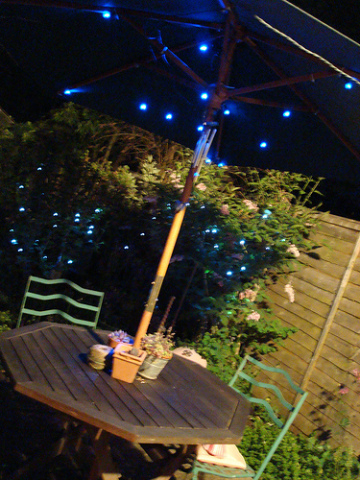 Solar fairy lights are best situated in an area that receives direct sunlight, so where you position them is critical so that the batteries can be recharged. So what happens when it's a cloudy day? Well even in overcast weather situations, the lights still receive some charge and emit light, but do know you won't get 8 hours of light like you would on super sunny day. Solar Fairy lights can add that perfect sparkle to a memorable soiree in the garden or add peace of mind in terms of home security. Now you can put an end to flick'in the switch, as these solar powered lights come with an auto timer feature which you can program in order to turn the lights off at a specific time. If you think these would look smashing in your outside garden area, you can grab a set from firebox.com at a price of $49.50 US and similar ones at Amazon. If Atlas Shrugged, Will Facebook Buckle? "With the invention of Solar Fairy lighting people are jazzing up their gardens, doorways and balcony railings without causing harm to the world."